Insufficient space is not an issue due to the compact design of the SP-1425. This scanner is designed to be used in all kinds of situations, including in places where space is limited. •Scanning both sides of a document in one go The ADF, which has a duplex scanning mode function, and the flatbed have been combined into a single compact scanner. •Can be placed anywhere The scanner can be used for any purpose in accordance with your business needs, such as scanning documents for clerical work purposes at an office and for identification/application purposes at a reception desk. An all-round model providing excellent operability. 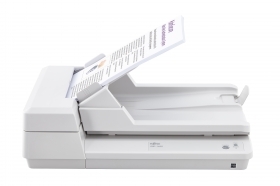 The scanner with the flatbed and the ADF, which has a stable paper feed function, supports your demands in order to raise business efficiency by meeting your needs for scanning various documents. •Fast scanning speed at a rate of 25 ppm / 50 ipm Fast scanning capability in duplex scanning mode with the ADF, 25 ppm/50 ipm (A4 portrait, color 200 dpi/300 dpi) has been enabled. •Efficiency made possible by combining flatbed and ADF Equipped with an ADF and flatbed, SP-1425 can scan various documents, from batches of paper to plastic cards* and passports. * Flatbed Only •Useful scanning solutions available The bundled software works together with your business system allowing you to use these solutions with ease, thus improving and making your business more efficient. Software programs that can be used for your business are bundled together with this scanner. The easy-to-understand UIs and the advanced image processing feature improves the efficiency of your work, which helps to greatly increase productivity. •PaperStream IP for SP Series automatically produces images of the highest clarity PaperStream IP for SP Series has attained high levels of image processing. This is a scanner driver that supports TWAIN/ISIS™, easily converting various documents into high-quality images automatically. Configuring or changing the settings according to the type or condition of a document is unnecessary. Images with good visibility and images that are suitable for post-processing such as OCR can be created. •PaperStream Capture Lite specializes in routine scans Seamless linkage with PaperStream IP is established by using "PaperStream Capture Lite" which is an application to scan documents, thus increasing productivity with the easy to use operability. In addition, this application focuses on routine scans, such as batch scanning, and has easy-to-understand UIs for users and administrators, thus raising the level of business efficiency. •Searchable documents made possible with ABBYY™ FineReader™ Sprint An OCR application to convert images scanned with the SP-1425 into Word/Excel® documents. Once scanned images are converted into these document formats, it becomes easier to edit these documents in Word/Excel files than PDF files, which improves businesses efficiency. *With Fujitsu's SP series the version of PaperStream Capture bundled is PaperStream Capture Lite.